It's vacation time and thousands of people are flocking to our national parks. We are blessed in this country to have so many wonderful parks to visit, but have you ever wondered who was responsible for these parks? You might think the government, the Congress, or the President, but most of the credit can go to one man whose passion influenced the aforementioned entities. His name was John Muir, and you might recognize him as founder of the Sierra Club or the namesake of Muir Woods - California Redwood Forest. He is also credited with being the father of our national parks. So how did that happen? Setting out in September 1867, the young man embarked on a trip to Florida, writing about it in his book A Thousand Miles to the Gulf. Without a particular route to follow, he wandered through the war-torn states of the South. Such a trip in today’s times seems risky, but in post-Civil War, it was especially dangerous. With no GPS, no car, and no place to stay, Muir walked through woods and fields recording the flora and fauna he saw along the way. In a light rucksack, he carried a plant press, a leather-bound journal, pencils, and a New Testament. He walked 15 to 20 miles a day, as he described “led by the Spirit,” enjoying the variety of plant life, often sketching it in his journal. Muir saw first-hand the ravages of war on the countryside, resulting in a wariness of Southerners to Northern strangers like himself. He was often refused food and lodging, warned about murderous “mountain men,” and had to rely on the mercy of poor farmers for simple rations and a place to stay. Through the mountains of Tennessee across Georgia, Muir traveled, avoiding people as necessary, spending many nights on the ground. 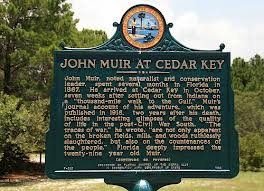 From Savannah he boarded a steamship to Fernandina, Florida and from there he walked across the state through pine forests, spiky palmetto, and swamps, ending up at Cedar Keys on the Gulf of Mexico. Muir desired to continue on to South America, but had to wait until a ship headed that way came into port. To pay for his passage, he took a job at a lumber mill, but days later, collapsed with malaria and was taken in by the mill manager's family while he recuperated. It took three months for him to recover and leave for Cuba, but after his trip to Havana, he decided to change his course and head west for a drier climate. 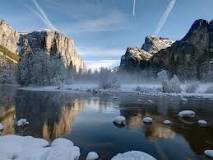 And that’s where he spent the rest of his life, discovering Yosemite and writing about the need to conserve the wilderness. His letters to Congress encouraged them to pass the National Park bill in 1890. He founded the Sierra Club in 1892, an organization devoted to protecting the environment. A prolific writer, Muir wrote over 300 articles and 12 books. Thanks to his passion for preservation, we can now enjoy parts of our world still unspoiled by the encroachment of civilization. So, what are your favorite parks? Are you planning to visit them this summer? 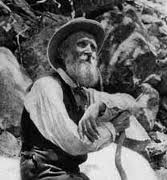 I didn't know the story behind John Muir's decision to start the Sierra Club and lobby for parks. What a blessing that he followed his dream and his passion. We get to enjoy the fruits of his labor even today! It's amazing what effect one person can have when they follow their passion, isn't it Pam? I loved this post, Marilyn. Thanks for sharing about this one man conservation movement. Very inspiring! Hi Kathleen, Glad you found it as interesting as I did. Hi Sharon. Sounds like you've been to more national parks than I have. 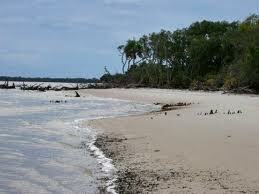 I live in Florida and haven't been to the Everglades yet (I live in North Florida), but it's on my bucket list!